It’s no secret that the PC market has been in a sustained slump for what seems like forever now, but Microsoft has a plan to try and kick things up a gear in 2017, urging computer manufacturers to focus on not just better performance (which is a given), but also ‘cool designs’ and pushing Windows 10’s unique features. The company’s suggested strategy for OEMs (device makers) was laid out at the WinHEC 2016 conference over in China, back in December, with presentation slides only just coming to light courtesy of ZDNet. ‘What makes a modern PC?’ That’s the question posed at the top of one of the key slides, and Microsoft’s first answer is ‘cool designs’ which make the product stand out. Traditionally, of course, Microsoft has hardly been regarded as ‘cool’ itself, but all that changed, at least in hardware terms, with the development of the Surface range. 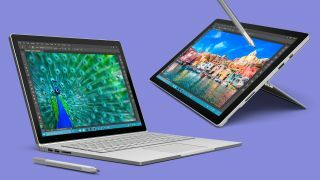 At any rate, Microsoft's suggestions to OEMs include a focus on 2-in-1s and ultra-slim models, unsurprisingly, as these are generally the slick-looking PCs, and of course convertibles are expected to be a massive growth area. Microsoft also highlights the use of its Precision Touchpad and OEM innovation in terms of elements such as borderless displays (i.e. vanishingly slim bezels) and fancy hinge designs – premium-looking machines, in other words. Essentially, this is a call to PC vendors to focus on more compelling and innovative hardware, which will also be sold, Microsoft further urges, on the software front as well by the use of at least two ‘hero features’ drawn from Windows 10. Here, we are talking about Cortana (including far-field voice commands, i.e. from across the room), Windows Hello (secure biometric logins) and Windows Ink (touchscreen and stylus scrawling). We can also expect some funky new peripherals which are tied in with the above three hero features – think along the lines of the Surface Dial, along with wearables, headsets and so forth. As well as innovative 2-in-1 devices with pens, Microsoft also envisions PCs which will power ‘mixed reality’ experiences coming to the market this year – not just traditional computers, but notebooks and ‘backpack’ PCs which can drive Windows Holographic headsets (the offerings that’ll be much cheaper than the current crop of VR headsets). And the company also wants PCs for gamers to be brought to the fore, with powerful graphics cards (naturally) and Xbox-compatible peripherals. Of course, Microsoft is already trying to tie its console and PCs closer together with initiatives like Play Anywhere, and we can doubtless expect more of this going forward. It seems like this was a pretty major pep-talk for PC makers, and let’s hope it does bear fruit in terms of firing up some innovation, and the appearance of devices which make better use of Windows 10’s unique features.